$20 will buy four (5) bales of straw which will last approx. one week. $13.00 will buy one 50lb bag of protein. $4.50 will buy one (1) bushel (56lbs) of corn. Fifty pounds of protein mixed with two (2) bushels of corn feeds the Sanctuary’s waterfowl for approximately 2-3 days depending on how many wild mallards are visiting at the time! 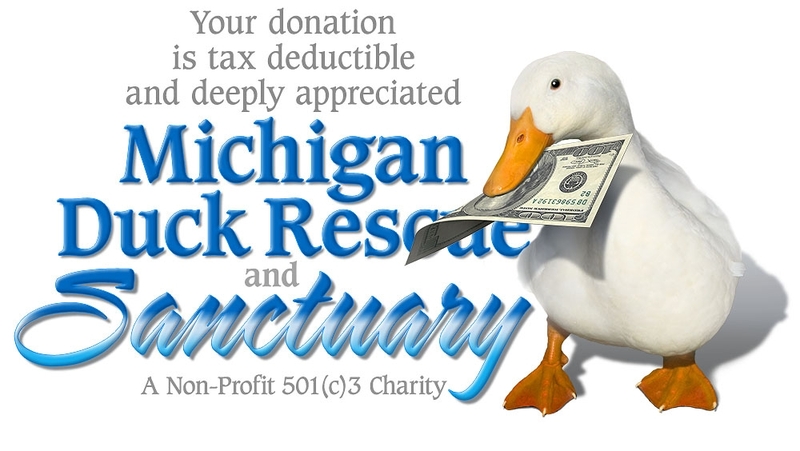 Michigan Duck Rescue and Sanctuary is a Non-Profit 501(c)3 Charity Corporation dedicated to the rescue, care, protection and housing of unwanted domestic waterfowl and domestic birds. I did it again… I donated for the parrot. Did you get the last bill pay donation yet.?? Please use this donation, in the name of Daisy, toward anything you need for the ducks. STILL waiting for the location!! Thank you for all you do for domestic ducks! Would it be possible to see the sanctuary? I live in Novi.